Previous post: What the HELL was I thinking? Stir all ingredients together into a gooey dough. Spray lightly with oil, cover tightly with saran wrap, and let sit overnight on the counter. It will double, if not more. Morning the next day, with spatula gently fold dough over on itself. Spray lightly with oil, cover tightly with saran wrap, and let rise until double, 4 – 6 hours. Heat oven to 450F, with cast iron dutch oven with lid on in the oven. When oven is heated, remove dutch oven and lid from oven. With oiled spatula encourage dough gently into dutch oven. Shake dutch oven to round and center dough. 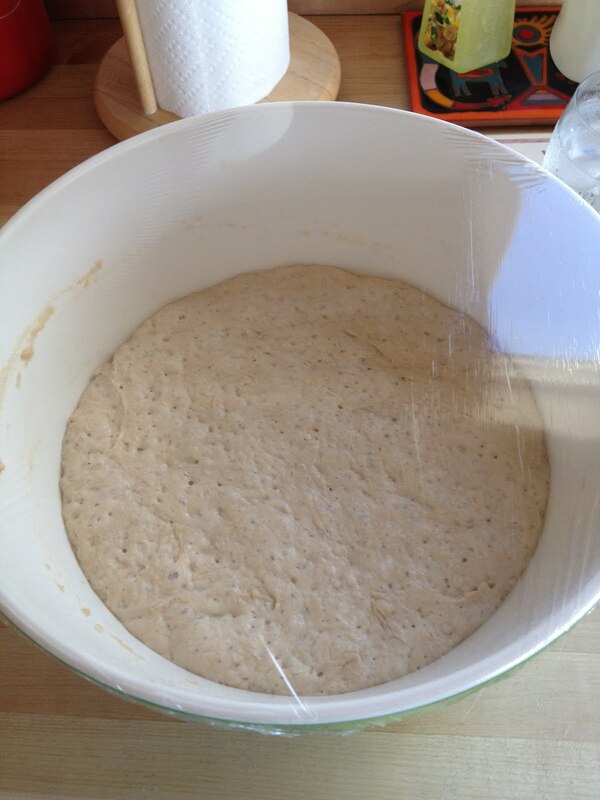 Spray dough lavishly with water, cover, and put in oven. Bake 50 minutes. Reduce oven temperature to 425F, remove lid, and bake for 20 minutes more. This recipe began with Jim Lahy’s Sullivan Street Bakery No-Knead Bread recipe in the New York Times. All respect due to Mr. Lahy, I see no need to mess up a perfectly good dish towel. *Use the best quality flour you can find. I use Bob’s Red Mill Unbleached White. *I get my bread water out of the refrigerator dispenser. It’s filtered. This bread seems to really like it. 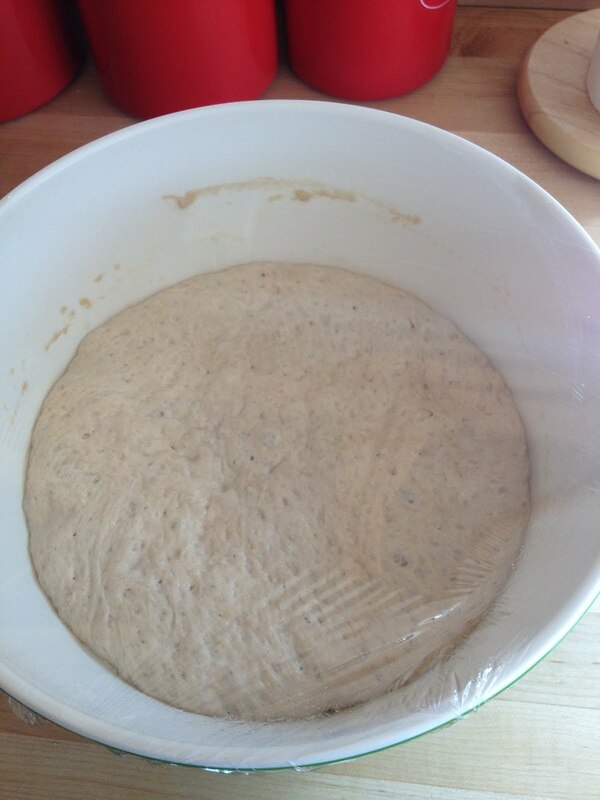 *Stick the dough in the refrigerator for either rise. It will take longer to double but it won’t hurt it a bit. 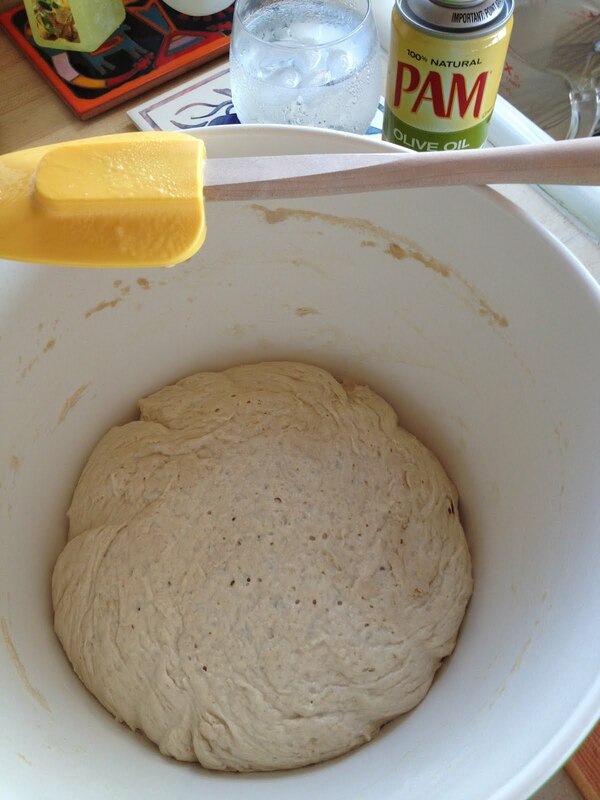 *For this batch, I substituted 5 ounces of whole wheat flour for 5 ounces of unbleached white flour. A visiting friend likes brown bread. Dana, For my bread I added about a cup of spent grain from some homebrew my son and I made. It was amazing. I bet you could visit one of the breweries near your home and ask for some. Oh. I use a lovely cool rise recipe that lets you make it the day before, and leave it in the fridge over night. Then bake it off in the morning, or whenever. I love it because I can have hot fresh baked bread first thing in the morning, without getting up at 4 a.m. to make it happen. Sometimes I stick the first rise in the fridge, Ginny. Doesn’t hurt it a bit. Avais36, let me know how it turns out! Scott, that sounds positively yummy. I shall investigate. I know Homer has a brewer, I just don’t know where it is. 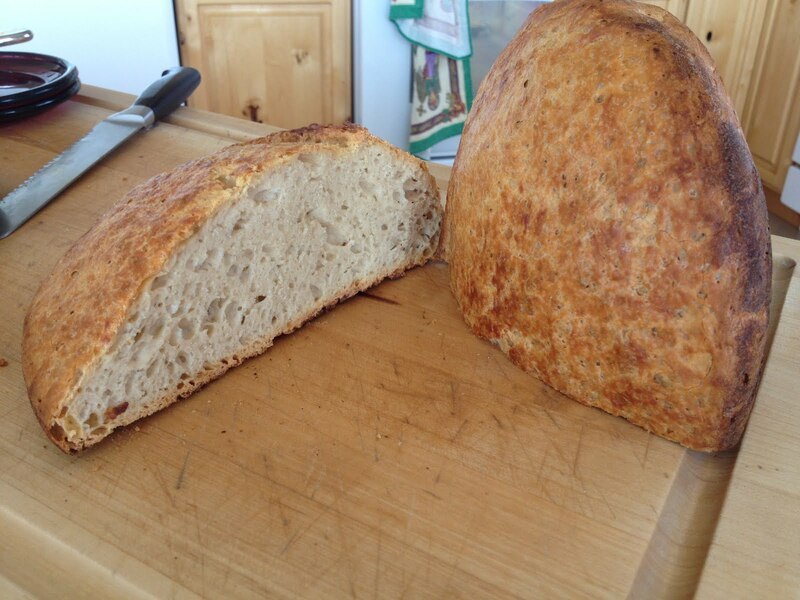 I bake a couple varieties of no-knead bread. My favorite (only) flour is King Arthur. It’s available online, & if you sign up for their emails, they offer free shipping a few times a year. Their 9-grain cereal is wonderful in whole-grain breads.